428 pages | 5 B/W Illus. 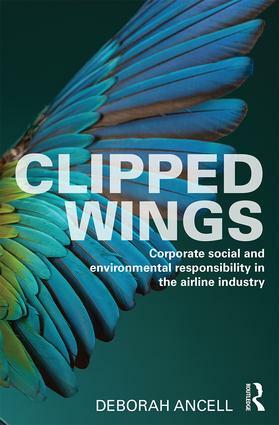 Within the developed world, airlines have responded to the advice of advocates for corporate social and environmental responsibility (CSER) to use the intertwined dimensions of economics, society and environment to guide their business activities. However, disingenuously, the advocates and regulators frequently pay insufficient attention to the economics which are critical to airlines’ sustainability and profits. This omission pushes airlines into the unprofitable domain of CSERplus. The author identifies alleged market inefficiencies and failures, examines CSERplus impacts on international competition and assesses the unintended consequences of the regulations. She also provides innovative ideas for future-proofing airlines. Clipped Wings is a treatise for business professionals featuring academic research as well as industry anecdotes. It is written for airlines (including their owners, employees, passengers and suppliers), airports, trade associations, policy makers, educators, students, consultants, CSERplus specialists and anyone who is concerned about the future of competitive airlines. Deborah Ancell had a long career in the airline industry covering customer service, construction and sustainability. During her tenure, she observed the effects of social and environmental legislation implemented without economic impact assessments. This became a research field and her employers in the airline industry supported her by sponsoring MSc and PhD studies in economics and innovation. Subsequently, she became a university academic teaching economics in transport and construction at the University of Westminster, UK. Her research interests are wide-ranging, from buildings and education through to transport and airline sustainability.